In my Google Panda Algo article, one of the statements given to me by Google was that Panda was now a core ranking signal. But there was some confusion because people assumed this meant that Panda was now real time. But Google confirmed that this is NOT true. Panda is not real-time. Gary Illyes from Google was questioned about it several times on Twitter yesterday, and he confirmed that Panda is not real-time. Also, there is a core ranking change that people are seeing in the search results right now, but Google also confirmed it is not Panda. Gary Illyes said specifically they haven’t updated the Panda part. 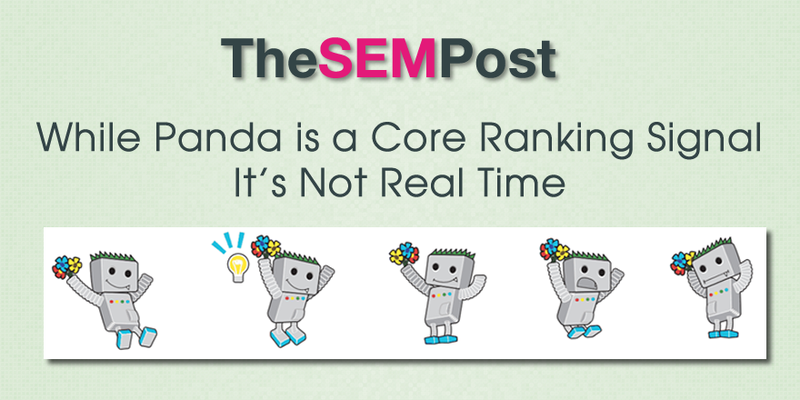 So the fact that Panda is a core ranking signal now doesn’t mean it is real-time. There were definitely some SEOs that were excited by the possibility that they could start out with crap spun or scraped content, and slowly raise the quality to see where the “sweet spot” between Panda-target and Panda-good was. And that wouldn’t be good for Google’s overall quality in the search results. So I can definitely see why a real time Panda isn’t happening, even with it being a core ranking signal now. When Penguin updates next it will be real time. But Panda is confirmed to not being real time.